A while ago, I was introduced to the Clarins Facial Institute where I was offered the Madagascar Hydrating Facial. I rather liked it so in August, when HSBC credit cards ran a promotion where you could get a Buy 1 Free 1 Facial from Clarins Facial Institute at KLCC or 1 Utama, I dropped by Suria KLCC to purchase a facial. Incidentally, Clarins does these Buy 1 Free 1 promotions quite often with selected credit cards so look through the bank brochure before you toss it. The facial I had cost RM198/1 hour but its only really about 45-50 minutes max for the facial itself. If you dislike facials that leave your face dripping wet after the facial, or where they do painful extractions and use all sorts of swanky looking machines on your face, Clarins is where you should go. They operate strictly on a no machine, no extractions facial policy so they are truly “hands on”. The facial starts with a visual and tactile analysis by your therapist in the facial room. Then, it follows up with an interesting relaxation technique where you are gently shaken all over while you clench and unclench your muscles. Don’t laugh – it works ok! Thereafter, the therapist will proceed with the facial, doing facial massages and applying things to your skin using only their hands. There is a lot of patting on your face so products absorb better, they say. Honestly, they do so much work on your face it suddenly doesn’t seem all that expensive 😛 I like how they warm up everything they place on your skin and how warm their hands are and your face feels – its all that blood moving around you see. But its not all paradise as we’ll see below. One down side to all that action is that I can’t seem to fall asleep during my facial. I usually doze off during my facials, but at Clarins, I’ve never once slept in my 3 sessions there 🙁 Also, I’m so used to my facials stretching for at least 2.5 hours for about the same cost or less, that a less than 1 hour facial at Clarins just isn’t enough anymore for a truly relaxing experience. I always leave with nice clean glowing skin that isn’t dripping wet nor bearing extraction marks so I’m relatively happy with my facials at Clarins on this score. Whilst treatment from when I arrive to when I leave is impeccable, I must make one comment on the after-facial treatment where I was subjected to a bit of a hardsell of products and treatment packages. Yes, I know Clarins has got good products. I really like the Clarins Hydraquench Cream Mask but I’m not usually at my best after a facial to decide and that’s probably what they are banging on. That you might be so addled you buy something so they ease back on you. So I don’t quite like that much. If they would ease back on the hard sell and showing me a whole range of products that I could take home for a large sum of money, I’d like the Clarins Facial Institute more. Clarins Facial Institute or Facial booth? Those more observant amongst you might have noticed that some Clarins counters in department stores have facial services as well at about RM50 cheaper for about 15 minutes shorter time. I’ve asked what the difference is and I’m told that the difference lies in ambiance and some extra services at the Institute e.g hand or eye massage which may not be included in the service at the counter facial booth. I’m going to try the Clarins Facial booth one day. And when I do, I’ll compare the 2 services and tell you what I think! Super sleuth to the rescue! 😀 If you’ve tried both services please feel free to tell me what you think! 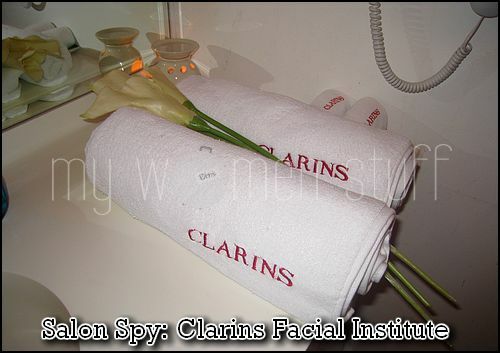 The Clarins Facial Institute is at Suria KLCC, 1 Utama New Wing, Sunway Pyramid and Spring Kuching. PREVIOUS POST: YSL Love Collection Compact Powder and Blush – Is it love? NEXT POST: Merry Christmas and a pretty pink lace tidbit! 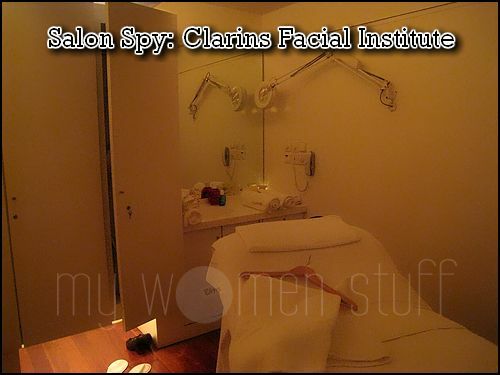 I am going to Clarins facial in Parkson Counter in Subang Parade. The room is smaller, but the ambience is quite good, they have soothing background music and aroma oil scent. They do massage my hands with lotion quick one, more like sapu the lotion on my hand and for eyes treatment, have to pay another Rm55. What I like about them is the face massage, which is suppose to help detox and enhance circulation to the face. The lady is quite good, she did not hard sell her product. Sometimes, they give out samples too. I am not sure if extraction is necessary in facials, they do leave marks on the face. What do you think? My Clarins package is ending soon, am thinking to sign up with Adonis. Have you tried them before? I haven’t tried Adonis so I can’t help you sorry! Perhaps someone else might have 🙂 As for extractions, I believe in them only for “ripe” pimples or stubborn blackheads. If done properly, there are no marks on the skin. Thanks for sharing your experience in a facial booth! 🙂 Merry Christmas! Clarins Institute @ KLCC was one of my favourite place for facial, untill i have acne problem. Atmosphere were great, the scent, the people and the service make it even better place. However, the facial treatment purely depend on manual massage aka human hands really a big turn off for me, when i need a deep cleansing facial. So, after a few treatment, i really have to say bye bye to them. I fully agree with you – the atmosphere in the salon is wonderful! But I do get what you mean about the efficacy of just using hands for massage. Whilst I like it off and on, I found it a little “tiring” because I couldn’t relax much. I went to a facial booth at KLCC Isetan before, had a 45 minutes facial + 15minutes luminous eyes treatment. Enjoyed the experience. They did as me to purchase facial treatment package (that time there’s buy 4 free 1 promo), but no hardsell la..
when i used clarins products before and before they even had clarins institute, i went to their booths for facials (guess you might be calculating how many decades ago that was, huh? hehe..). anyways, i also did try out clarins institute a little later when they were open and i guess if you do not mind not getting the additional hand massages, a facial at their booth was good enough. they did extractions when i requested for it and they introduced me to their spot corrector which came in skin tones. it was that good and my skin didn’t look patchy after the facial. so it probably lies on your preference and how much you’d budget to clear up a congested/tired face. awww I seriously needed to relax 🙂 🙂 🙂 Happy holidays!!! I always fall asleep during facials too but I didn’t at the Clarins facial! And I thought it was because my session was in the morning :-/ Never ocurred to me that I won’t be able to sleep while being shaken. Thanks everyone! Your comments are all helpful. Clarins USA is hiring for a facialist and one question they ask on the application is how much do you want to earn per hour. Hmmmm. I don’t expect them to pay me what I make at my own spa, however I think they should be fair. My question for Paris is do you know how much the facialist made per hour? And what is RM198 and RM55 in American dollars? Those are the prices in Malaysian Ringgit. Try xe.com for a conversion. As for how much the facialist makes here, I’m afraid I do not know. I’d suggest you check with people in your area as in this part of the world, rates and prices are vastly different from the USA.